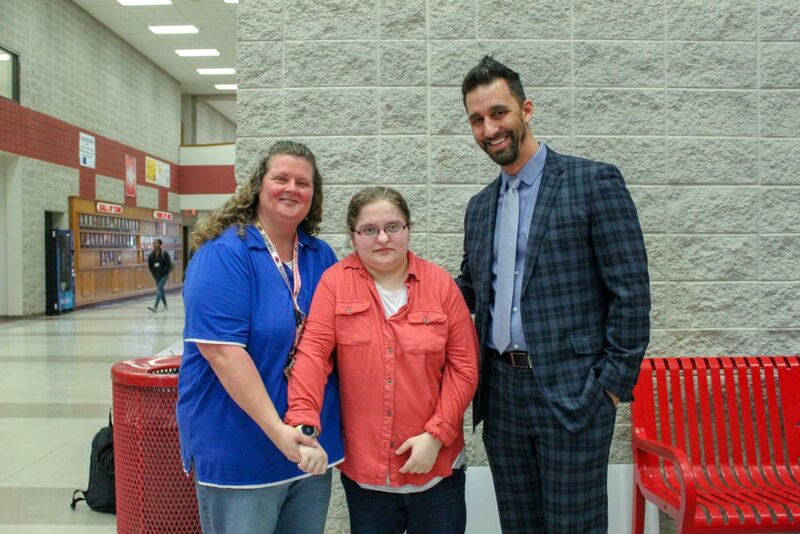 A Goshen High School student who wrote to the Parks and Recreation Department suggesting the construction of an all-inclusive playground received recognition by world-leading manufacturer of wheelchair vans and lifts BraunAbility for her advocacy for the disabled and special needs community. 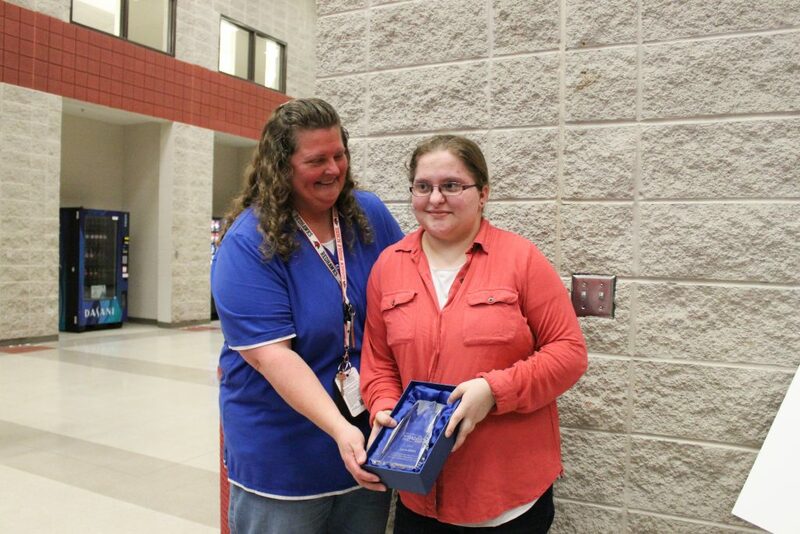 Laura Elliott received the “Spirit of Ability” Award at a ceremony held Tuesday, December 18 at Goshen High School. 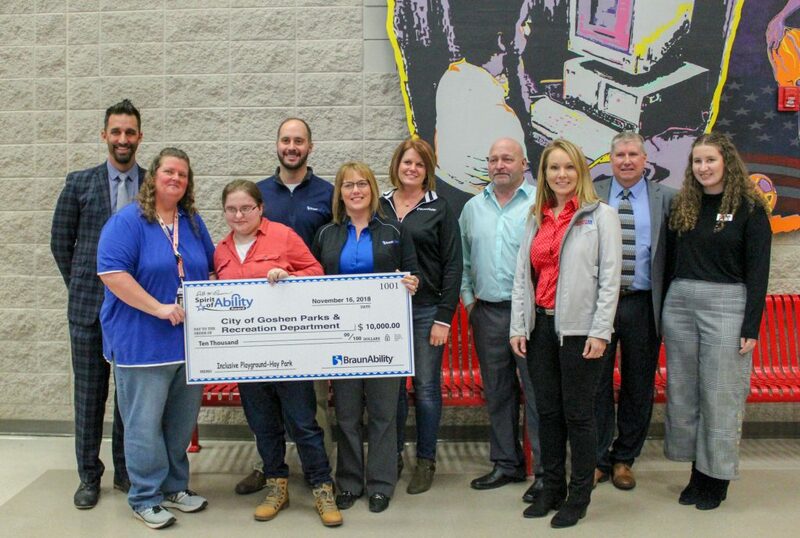 Laura was presented with a trophy and a $10,000 check — a donation made to the Parks & Recreation Department to help fund the completion of the all-inclusive playground at Hay Park, 1414 Plymouth Ave.
“Thanks to the courage Laura displayed when she wrote her letter campaigning for this inclusive park, finally, in the spring of 2019, Hay Park will be the home of a place where everyone is welcome, regardless of ability,” Greg Kiser, vice president of consumer sales for BraunAbility, said. Mayor Jeremy Stutsman announced at the ceremony that the City is looking to break ground of the new playground in the spring of 2019. Laura was praised by her family and teacher, who both worked with her to get her letter to the City back in early 2017. Rochelle Elliott, Laura’s mom, thanked BraunAbility and expressed how important it was for her daughter’s dream to become reality. About the award: The Ralph W. Braun Spirit of Ability Award is presented to individuals who emulate the qualities that BraunAbility founder Ralph Braun displayed: selflessness, compassion, and an unwavering dedication to do what is right for people in the disability community. 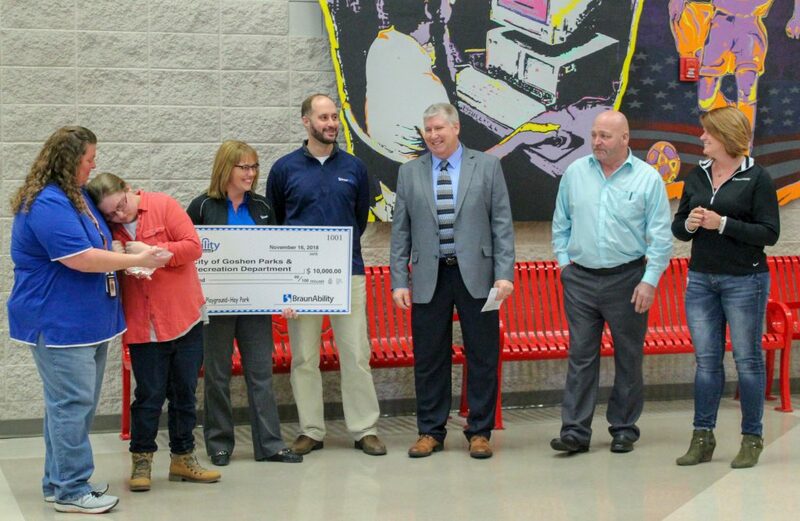 The award is given at BraunAbility community events across the United States and Canada. For more information, please go to braunability.com/spirit-of-ability/. This entry was posted in Hearings on December 18, 2018 by Sharon. The temperature climbed up slightly this weekend and will remain above freezing this week. 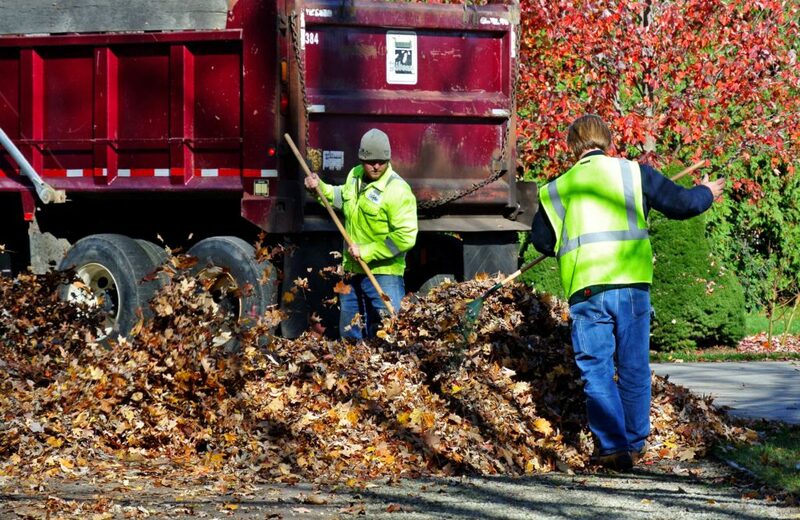 With the warmer, dry weather, residents may feel tempted to rake their remaining leaves. However, the Street Department will NOT do any more leaf collection rounds this year, as stated previously. Street Commissioner David Gibbs asks residents to keep their piled leaves away from the roadways, as they can interfere with the flow of traffic and, if it snows, the snow plows will be forced to drive over the leaf piles and end up throwing leaves back into the yard. Residents who still want to clean their yards and are able to, can take their leaves to the Environmental Center at 20100 CR 29. The Environmental Center will take leaves at no fee to Goshen Residents (proof of residency will be required). 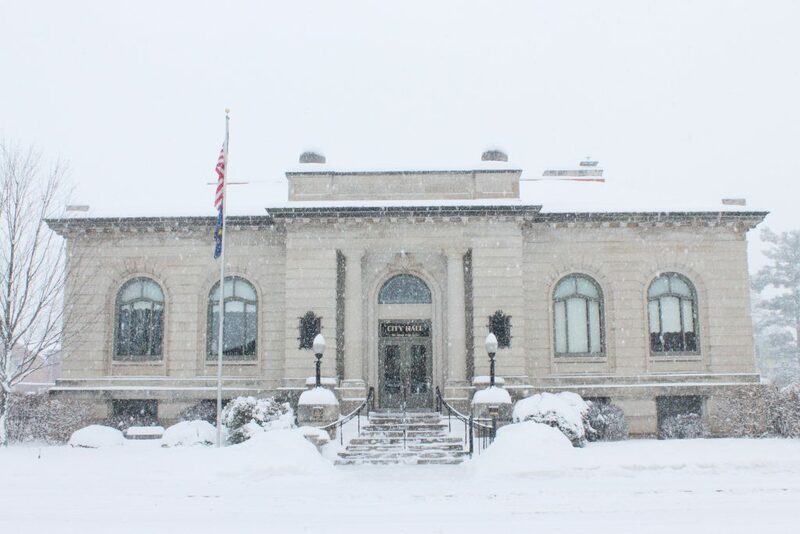 The center is open Monday through Friday from 8 a.m. to 4 p.m. The Environmental’s phone number is 533.6200. This entry was posted in Hearings on December 17, 2018 by Sharon. The public is invited to attend Goshen Mayor Jeremy Stutsman’s Holiday Open House Wednesday, December 19, 2–4 p.m., at his office, City Hall, 202 S. Fifth St. Guests are asked to remember the homeless among us this Christmas season; items will be collected to be distributed by local helping agencies. Those agencies suggest donating these items, among others: hats, gloves, scarves, toiletries, socks, blankets, or sleeping pads. This entry was posted in Hearings on December 12, 2018 by Sharon. As a combined project, the Goshen VFW (Veterans of Foreign Wars), American Legion and DAV (Disabled American Veterans) are again this year, putting together the Memorial Day Observance. The day’s events will begin with a ceremony at the Rogers Park Footbridge at 8:45 a.m. From there another brief service will be held at the War Memorial at the Elkhart County Courthouse (in Goshen) at 9 a.m. The Memorial Day Parade participants will form up starting at 9:30 a.m. at N. Fifth and E. Jefferson in front of the Goshen police Courts Building. The parade will step off promptly at 10:15 a.m. and end at Oakridge Cemetery. The ceremony at Oakridge cemetery will be held at 11 a.m., with the placement of wreaths and addresses of invited speakers. Everyone is invited to attend any and all of the day’s events. Anyone wishing to participate in the Memorial Day parade may pick up an application at the Goshen VFW, DAV or Police Department. The applications must be completed and turned in not later than end of business, Friday, May 25, 2018. The parade route will start at Main and Jefferson Streets and travel north on Main Street to Pike Street. The parade will travel west on Pike Street, north on First Street to Oakridge Cemetery. This entry was posted in Hearings on May 25, 2018 by Sharon. The Goshen Fire Department will test the tornado sirens Tuesday, March 20 at 10 a.m. and at 7 p.m. as part of the Statewide Tornado Drill. The annual Indiana Severe Weather and Flood Preparedness Week runs from March 18 through March 24 this year. As part of NWS efforts to build a Weather Ready Nation, the goal of Severe Weather Preparedness Week is to better educate people about the hazards of severe thunderstorms and tornadoes, and to help everyone be prepared when severe weather occurs. Each day will focus on a different topic. Learn more about everyone’s role in the warning process by clicking here. This entry was posted in Hearings, News & Events on March 19, 2018 by Sharon. We have been getting questions about whether our system’s water is safe to drink. We are not under a boil order, meaning our potable water is safe to drink and shower in. Our utilities department is asking residents conserve as much water as possible, as our wastewater plant is at its limits. This entry was posted in Hearings on February 21, 2018 by Sharon. Pictured in the front row, from left, are Israel Zamora, Ruben Zamora, Lyndsi Stratton and her children, Ryan Garcia and Charles Steele. Four Goshen residents received a Civilian Commendation Award from the Police Department for helping save a woman and her children, who were entrapped in a vehicle following an accident. Lyndsi Stratton was driving on West Wilden Avenue in the early evening of June 30 when she hit the bridge railing at Rock Run Creek. The vehicle flipped and landed upside down on the creek. Two men driving by, Israel and Ruben Zamora, saw the accident and immediately stopped and ran to Stratton’s vehicle to help get her and her children out. Two other passersby, Charles Steele and Ryan Garcia, also approached Stratton’s vehicle to help. Together, all four men were about to get the children out and care for them until emergency personnel arrived at the scene. 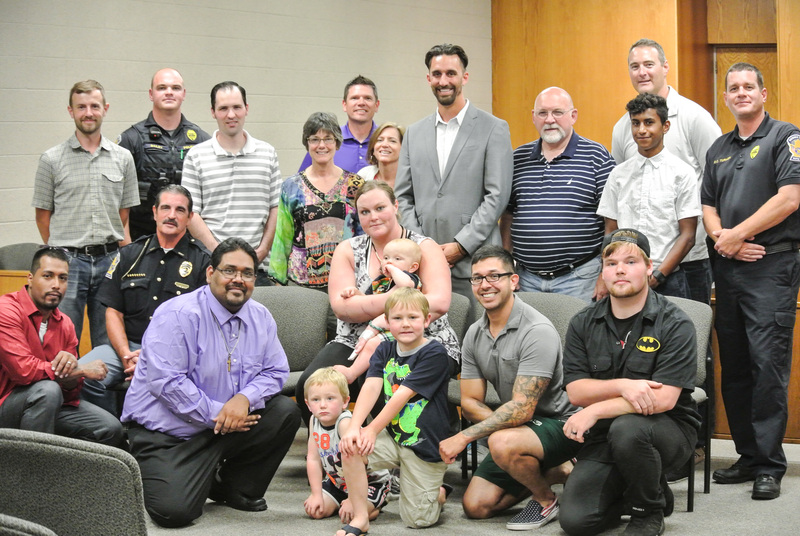 During the City Council meeting Tuesday, Aug. 1, Stratton and the Police Department handed out awards to the four men who were there to help her. Police Chief Wade Branson and Mayor Jeremy Stutsman commended and thanked those involved for their service to the community. This entry was posted in Hearings on August 2, 2017 by Sharon. 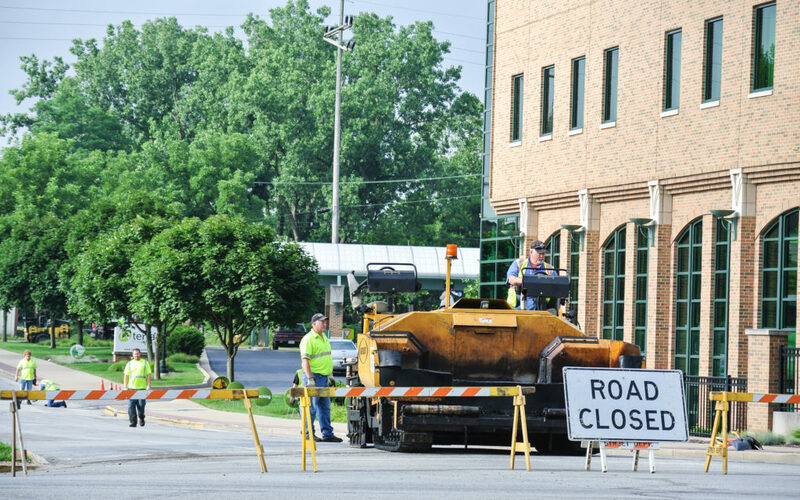 South Second Street is tentatively scheduled to be closed between West Lincoln Avenue and West Washington Street a few hours Monday, July 17, for paving. The street will reopen the same day. This entry was posted in Hearings, News & Events on July 17, 2017 by Sharon. NOTE: The free tickets the City had to America’s Freedom Fest —a day-long event of airshows and fireworks Saturday, July 1, to celebrate Independence Day—have all been picked up at City Hall. In honor of the Year of Goodness, Mayor Jeremy Stutsman and the Goshen City Council have secured 350 tickets to America’s Freedom Fest, a day-long celebration featuring an airshow and fireworks display, and will make them available to any Goshen residents who wish to attend the event. America’s Freedom Fest, which celebrates Independence Day, will take place Saturday, July 1, at the Goshen Municipal Airport. Although this is not an event organized by the City, Mayor Stutsman said he feels the annual fireworks display has become an important event for the community, and therefore it was important to continue making the event as accessible as possible for all. While the Freedom Fest event has an admittance fee of $10 for adults and $5 for kids 6-12 years old, Mayor Stutsman said he will have all 350 tickets available at a first-come, first-serve basis, and may be picked up at the City Hall front desk during normal business hours. Tickets will be available June 22 through June 30 and will be limited to the individual who picks them up and their immediate family, (no more than six per family). If all tickets are gone, an announcement will be made on the City of Goshen, Indiana Facebook page and on the city website at goshenindiana.org. This entry was posted in Hearings on June 22, 2017 by Sharon.